"My involvement in biodiesel is a direct response to 9/11… biodiesel has this tremendous potential because America is a car society. It is a tangible change that people can make, it is here today." "Biodiesel is great fun. It’s empowering. Nothing feels better than tooling down the highway with the knowledge that you are free. Free of Chevron. Free of Mobil. Free of George Bush. Free of the Saudis. Free of the whole sorry lot. … vegetable oil [is] here now. It works. It’s renewable. It’s sustainable. It smells good. It creates jobs in the United States. And there is no war required to get it." "Biodiesel is my most quixotic dream come true… Biodiesel is cheap. You can make it yourself. It smells like your favorite greasy donut shop. It’s noncarcinogenic. Most important, since my conversion to biodiesel I am no longer an accomplice to the human and environmental destruction caused by oil exploration, transportation, and policies… Biodiesel reduces carcinogens of truck exhaust by 90 percent, carbon monoxide by 43 percent, and particulates by 55 percent, according to conservative figures released by the EPA. " "Fry-O-Diesel in Philadelphia… are the folks working with trap grease as a feedstock. Since people will pay to have their trap grease hauled away, it would seem to be the holy grail of biodiesel." In the past half-century a desolate architecture oozed over the North American landscape. Petrified rivers of asphalt bisected fields, bridged rivers and imposed a cloverleaf-shaped model of on-and-off convenience. Ostensibly serving a mobile culture of increasingly free individuals, the interstate highways, like the 19th century railroads before them, are the transportation infrastructure that shapes countless human experiences. From the suburban “edge cities” that have risen to supplant the dense urban lives that grew around railroad stations, to the vast factories and workshops that employ millions in producing and servicing cars, parts, fuel, and roads, not to mention all the health care work dedicated to handling the death, mayhem, and illness caused by cars, our lives are heavily influenced by the car. Most of us can hardly imagine life “auto-free,” even if we don’t understand how to fix and maintain cars ourselves. In our car culture, sidewalk mechanics are a mainstay of modern life. Boys stand around watching their fathers or older brothers or neighbors as they crawl under cars, digging into the opaque mysteries of the internal combustion engine, and generally making a mess of themselves. This romantic male subculture is the stuff of legend; for many men their first car is a contemporary right of passage. Learning to fix one’s own car, or at least check the oil and tires, is to carry on a (false) tradition of rugged self-sufficiency deeply embedded in this culture. The car has long been a bastion of do-it-yourself tinkering and mechanical play. It is somehow appropriate that one of the most creative and productive technology revolts of our times has burned brightly on its margins. The sustainable biofuel boom of the past decade is a remarkable example of a passion-driven, grassroots techno-scientific movement, a decentralized, self-directing research and development program that thrives outside of normal business models and without the supposedly indispensable profit motive as its “driving” force. The expression “sustainable biofuel” indicates that there is more than one kind of biofuel. In fact, there are different approaches even within what is clearly the “alternative” to the mainstream. Biodiesel and biofuel cooperatives have formed, some to make bulk purchases of fuels for their own members, others to learn and teach how to convert engines to run on straight vegetable oil (SVO). Diesel engines can run most biodiesel fuels with no alteration, but for those who want to run “straight vegetable oil,” some modifications are required. 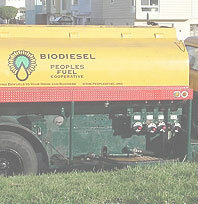 Different degrees of fanaticism or commitment lead some activists to insist on 100% biodiesel (as opposed to the B5 or B20—5% or 20% biodiesel mixed with regular petroleum-based diesel), straight vegetable oil, or fuel derived entirely from discarded, waste vegetable oil (French fry oil is a favorite).